As a tall black man on campus, Asante Nkosi has been asked numerous times by fellow students if he's attending UC Santa Cruz on a basketball scholarship. "I mean, I like basketball and I play basketball, but we're a Division III school—we don't even have sports scholarships!," says Nkosi, a graduating senior who's headed to UC Hastings College of Law this fall. The basketball query hints at assumptions African Americans face all too often, about belonging, merit, and achievement. For Nkosi, a double major in sociology and history allowed him to connect his experiences with his interest in black U.S. history, the Civil Rights Movement, and the contemporary moment. The historical roots of racial, economic, and social inequality illuminate today's injustices—and fuel his desire to make a positive contribution in the world. "I want to be a criminal defense attorney. I really want to help the most marginalized, vulnerable people in our society," he said. In his history courses, Nkosi learned about the forces that concentrated wealth and opportunity along lines of race, gender, and class. In sociology, he studied historical and contemporary portrayals of blacks in media and society. Conversation reflects his concerns: mass incarceration, police brutality, toxic masculinity, and the war on drugs. A Fresno native, Nkosi knew during high school that he wanted to come to UC Santa Cruz, even though African Americans make up only about 3 percent of the student population. Once here, he enjoyed the support of a strong community as a resident of the Rosa Parks African American Theme House (R.PAATH) at Stevenson College. "My first year, my RAs really promoted leadership in the black community," he said. "They showed us how to balance school and be advocates for our community—how to be a successful black student on this campus." Nkosi got a glimpse of that community as a high school senior during an overnight visit to campus sponsored by Destination Higher Education (DHE), a program coordinated by the Black Student Union that brings newly admitted black high school and transfer students to campus to connect with Afrikan/Black/Caribbean students. "After that visit, I knew I wanted to come here, because I knew there would be support," said Nkosi, who, as a sophomore, organized the DHE weekend for newly admitted prospective students. "That was my most cherished experience here at UCSC, coordinating that and giving back to a program that did so much for me. DHE taught me about important campus resources and helped me create lifelong friendships. My goal as an organizer was to create a space where students felt welcomed and a sense of belonging, and to give them some resources and advice as they began their journey." The Black Men's Alliance was another pillar of Nkosi's experience. As co-chair for the last two years, Nkosi facilitated weekly meetings with other black-identified men on campus, and networked with alumni around internships, jobs, and professional development opportunities. "It's a place to express ourselves and talk about issues," he said. Nkosi heard alum Darrick Smith (Oakes College, 1996, sociology), who was a founding member of the alliance in the mid-1990s, speak during his initial campus visit, and Smith's message of inclusion has stayed with him ever since. "Darrick emphasized that we're not here only for ourselves but as representatives for our community. He said it's important to give back to our community and to recognize those who came before us," said Nkosi. "I've grown so much as a leader. Being a positive role model for younger students is very important." Giving back comes naturally to Nkosi, who started collecting food and blankets for the homeless when he was in elementary school. 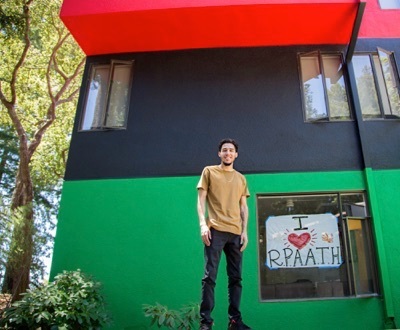 He spent the summer after his sophomore year interning with Faith in the Valley, a grassroots organization working to make Fresno more equitable. He traversed the city's most blighted neighborhoods to talk to residents and collect data about substandard housing. "We helped organize students, tenants, and homeowners in Fresno and ultimately passed two city ordinances to improve conditions for renters," he said. Nkosi gave a presentation about the work during the Pacific Sociological Association's 89th Annual Conference. Nkosi spent last fall in Argentina and Chile as part of the UC Education Abroad Program. He wanted to solidify the Spanish he'd learned in high school, and was drawn to the "Human Rights and Cultural Memory" theme of the coursework. "Both those countries endured military dictatorships, oppression, genocide—and their military leaders were taught by U.S. agents at a military school in Panama," he said, his voice rising with indignation. Now, with graduation on the horizon, Nkosi is shifting his focus to preparing for law school. The Division of Social Sciences honored his achievements by bestowing a $4,500 Gabriel Zimmerman Memorial Scholarship. That fund was created in memory of Gabe Zimmerman, an alum who was killed in the 2011 attack on Arizona Congresswoman Gaby Giffords. The support will carry him forward on his path of combatting social and economic injustice.